Oh my goodness Walter Murch is fab. I’ve just been to the ICA to hear him talk about ‘Return to OZ‘ which I hadn’t seen (it’s fantastic, and really quite dark) and I could hear him talk all day. He directed RtOZ but I know of him more as both a sound and film editor. He’s doing a masterclass for young film makers in April, in London at the Institute of Contemporary Arts (ICA) and if I was a film maker I’d be clambering over people to go to this. I’m not sure I can justify it but I’ll see if they’ll let me in, as an enthusiastic viewer (more truthfully, listener) of films. Here he is talking about film editing, for BAFTA Guru. I’ve read his ‘In the Blink of an Eye‘ book about film editing and film in general – I recommend it. “Frames of Representation is delighted to welcome Walter Murch, triple Oscar- and triple BAFTA-winning sound designer and editor of iconic films such as Apocalypse Now, The Godfather and The Conversation to host a masterclass on film editing. Universally acknowledged as a master in his field, Walter Murch coined the term ‘Sound Designer’ and helped to elevate the art and impact of film sound to a new level. In this unique masterclass, Walter Murch focuses on editing documentaries, exploring the methodology of merging fiction and documentary to explore perceived reality and human stories. The video above shows Sarah’s computer-controlled bell rig / carillion. Music is an adaptation of Troika, from Prokofiev’s Lieutenant Kije. Discover how to hook a computer up to simple sensors, LEDs and motors, via an Arduino board, so you can make reactive music and simple music machines. Includes beginners’ tips on electronics, programming and MaxMSP. How light sensors, switches, accelerometers and other off-the-peg sensors work, with an emphasis on simple, practical ways to use them. A brief introduction to motors, solenoids and LEDs which can be used to make your own music machines. How to make sensors, motors and LEDs ‘talk’ to your laptop, via an Arduino board, so they can use them with MaxMSP or other music software. How to combine and develop the above concepts to create your own novel, responsive, physical musical machines and software patches. Sarah will discuss how to think creatively and critically about the impact of these technologies in creative performance. Describe the differences between accelerometers, light sensors, ultrasonic sensors and other simple sensors and understand how to use them. 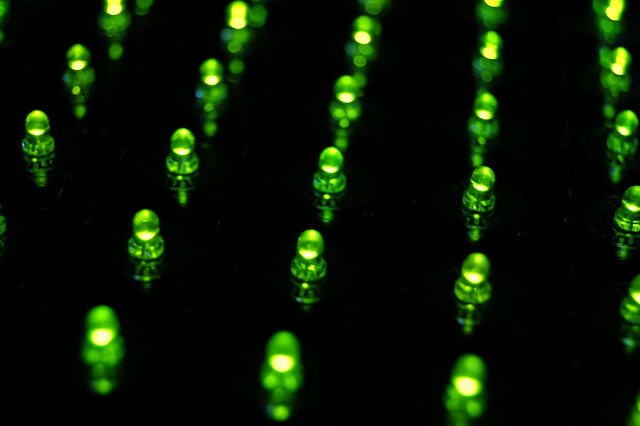 Demonstrate how to make LEDs, dc motors and servos work. Demonstrate how to make sensors and motors ‘talk’ to MaxMSP or Ableton, via an Arduino, so you can integrate them into your performance. 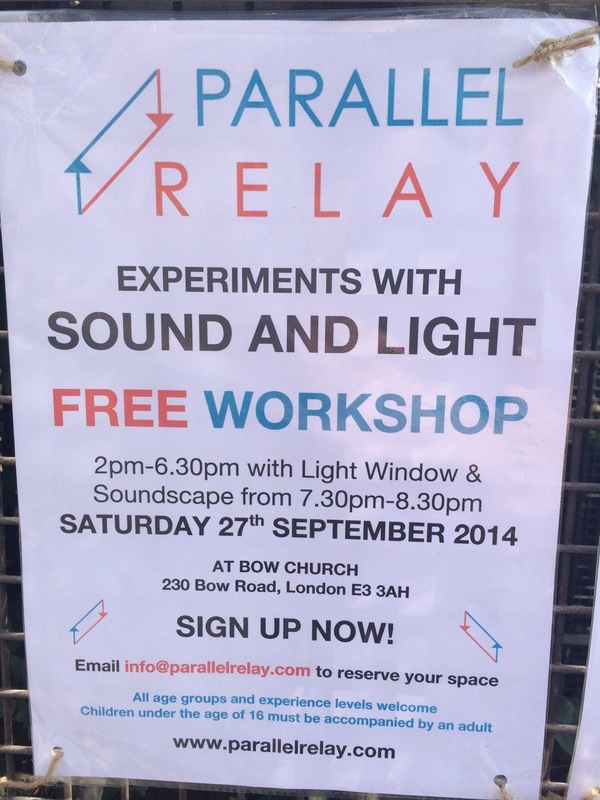 Have had some hands-on practical experience which you can build on later to create physical musical devices of your own. This course is open to beginners, who have never used an Arduino or electronics before and intermediate students who want to focus their skills on music making. We’re assuming you have some basic familiarity with a computer – and if you already have some programming or Arduino skills, you’ll be able to do more on the day. We’ll be using MaxMSP in the practical sessions. You’ll be given ready made patches which you can use or adapt. These patches are suitable for beginners but if you’re already familiar with MaxMSP you’re welcome to adapt or extend these patches. To enrol on a course, call 020 7831 7831. “Hear the Future: Machine Listening for Music and non-Music Sounds”. technology within art, the creative industries and the creative economy. academic boundaries of computer science, electronic engineering and music. and industry in electronic engineering, computer science, and music. on display during the day, including during the lunch and coffee breaks. discussions after the Workshop in a nearby Pub/Restaurant. Bow church finds itself in the middle of a very busy road that runs from Stratford to Mile End and beyond. It’s also where I sometimes get the 108 to Blackheath and isn’t far from Bow Church DLR and Bow Road tube station. 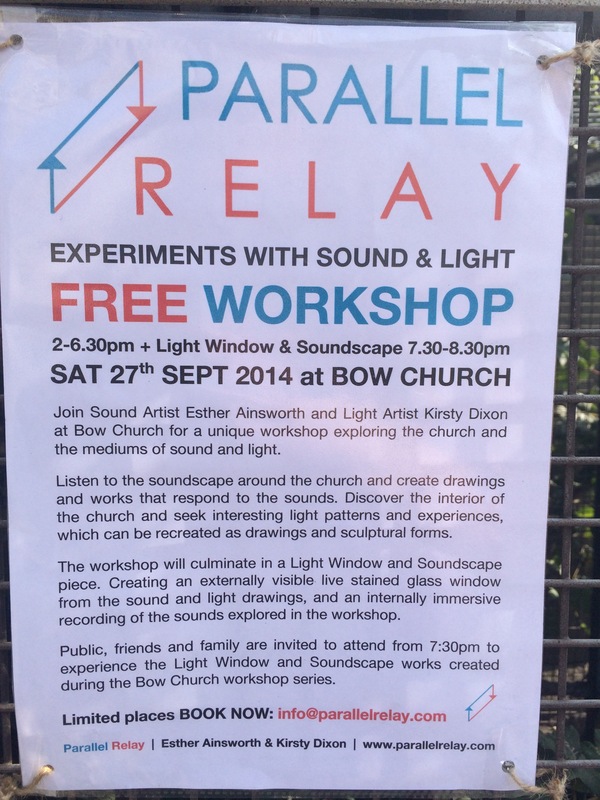 Next Saturday “Parallel Relay”, a project formed by a couple of artists, is putting on a free sound and light workshop in the afternoon, in the church, followed by an evening performance of the output from that. Contact info@parallelrelay.com for more info and to reserve a place.